As much as I love chopping—probably way more than is normal—I was looking for something that would minimize the amount of time between making a homemade winter meal and plopping my bum on the couch. 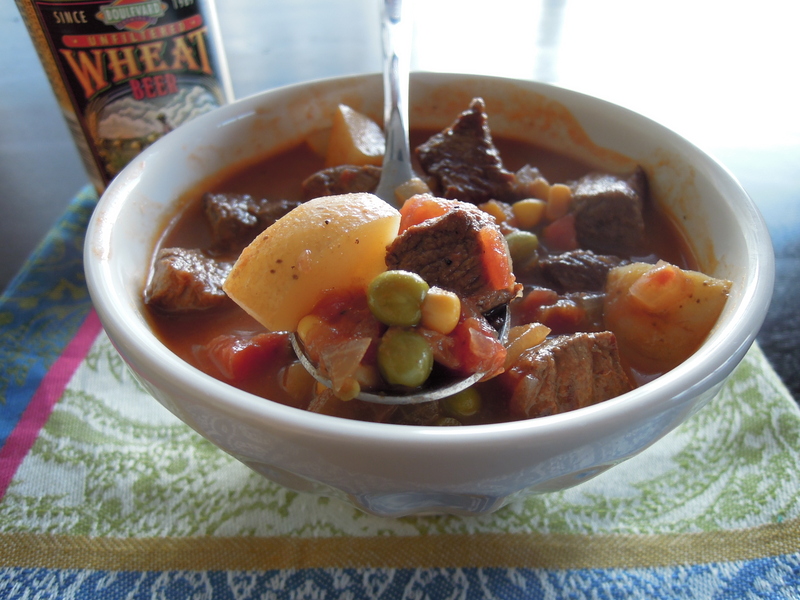 Plus, my grandma and my mom always made their beef soups with frozen veggies so I was searching with a sense of nostalgia, too. Finally, I ended up combining two recipes: One from Mark Bittman’s How to Cook Everything and one from a special issue (all soups!) of Better Homes and Gardens. The first included chunks of meat (yes, please! ), but freshly cut veggies (normally that’d totally be my jam, but I was on the hunt for a shortcut). The latter included frozen veggies (score! ), but ground meat (not this time). The result satisfied every item on my checklist and much, much more. Heat about 1 Tbsp of oil in a large pot on medium-high heat & swirl to coat bottom. Salt and pepper meat. Add beef in batches (be sure not to crowd) turning to brown on all sides. Once browned, transfer beef from pot to a plate and add next batch (I did it in three batches). Add additional oil as necessary. Once you remove the final batch, scrape brown bits off bottom of the pot with wooden spoon and pour out with accumulated fat. Return pot to heat. Add onion and celery. Sautee until onion softens, about 5 to 8 minutes. Return beef to pot. Add the broth, tomatoes, frozen vegetables, potatoes, and wine. Stir to combine. Bring to a boil. Cover and simmer for about 30 minutes. Salt & pepper to taste. 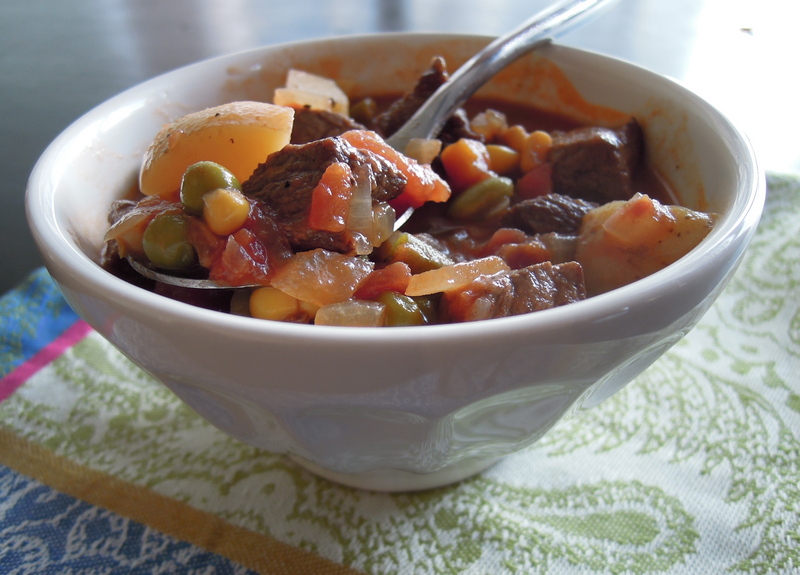 This entry was posted in Meat, Soup on January 15, 2012 by Paige Greenfield.